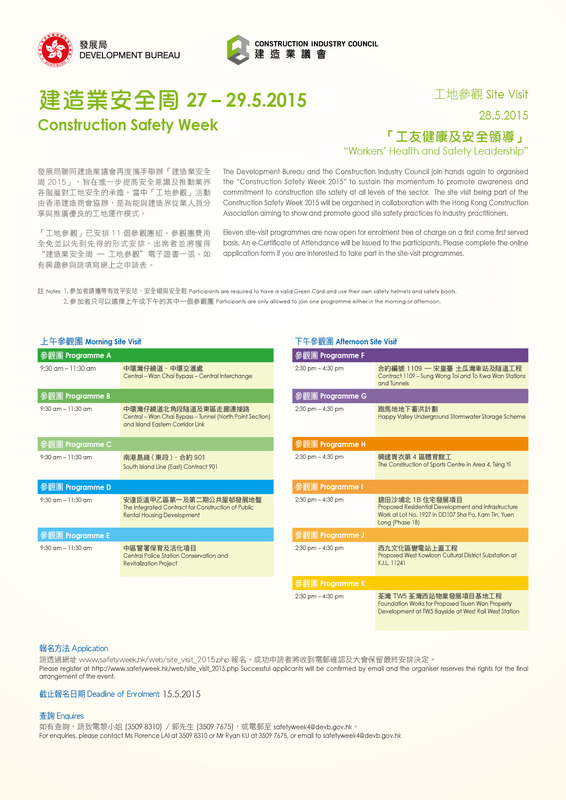 The Development Bureau and the Construction Industry Council join hands again to organise the “Construction Safety Week 2015” to sustain the momentum to promote awareness and commitment to construction site safety at all levels of the sector. The site visit being part of the Construction Safety Week 2015 will be organised in collaboration with the Hong Kong Construction Association aiming to show and promote good site safety practices to industry practitioners. Eleven site-visit programmes are now open forenrolment free of charge on a first come first served basis. An e-Certificate of Attendance will be issued to the participants. Please complete the online application form if you are interested to take part in the site-visit programmes. Registration will be processed on a “first-come-first-served” basis. Participants are required to have a valid Green Card and use their own safety helmet and safety boots. Participants are only allowed to join one programme either in the morning or afternoon. Successful applicants will be confirmed by email and the organiser reserves the rights for the final arrangement of the event. Successful applicants will be informed by email regarding the gathering time and location for each site visit. Upon pre-warning thereof, or announcement of Tropical Cyclone Warning No. 8 or above, or Black Rainstorm Warning Signal, this programme will be cancelled. At 7:00 a.m. on that day, should typhoon signal no. 3, or the Yellow/Read/Black rainstorm signals are hoisted, ALL MORNING PROGRAMMES will be cancelled. At 12:00noon on that day, should typhoon signal no. 3, or the Yellow/Red/Black rainstorm signals are hoisted, ALL AFTERNOON PROGRAMMES will be cancelled.